Customize and share Christmas party flyers in minutes! The most wonderful time of the year brings the most wonderful types of parties and events. 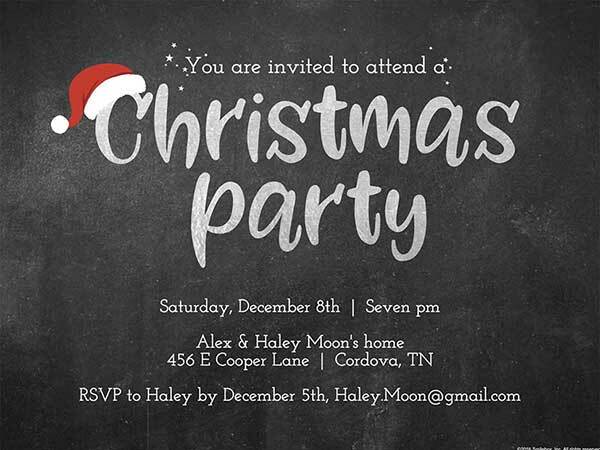 In moments, you can find a free Christmas flyer template to match the party you have in mind. Add a photo and details about the bash by using one of our expertly designed Christmas party flyers, and you’re done. Our free Christmas flyer maker is easy to use and offers a wide variety of templates to choose from. During one of the busiest times of the year, these two qualities are a blessing. Making an online Christmas party flyer can be done quickly between buying gifts and making dinner. Smilebox’s free Christmas flyer templates are beautifully designed and look even better after you’ve personalized them. See below how simple it is to create a Christmas party flyer. Online Christmas party flyers from Smilebox are available with numerous themes. All you need to do is find the one that suits your taste, click it, and then choose “Personalize”. You can go over last year’s Christmas images, photos that you took throughout the year, or just leave the free Christmas flyer template as it is. If you want to use one of your own photos, click “Add Photos” and follow the instructions (make sure the Photo Option is turned on). A Christmas party flyer can be made in a wide range of styles, but that’s just the beginning of your unique creation. Easily personalize our free Christmas flyer templates by changing the text, font, colors and more—and top it off with the music of your choice. Ensure that all your T's have been crossed with our “Preview” feature, and then finalize your Christmas party flyer. Smilebox lets you share it with guests and anyone else you have in mind at this time of year. You can send your online Christmas flyer to family and friends through email and social media, save to your computer, and print it. Because of their easy sharing functions, Christmas flyers can be sent to everyone in your office, those in your personal life, and friends in your social network. You can choose to send via email, through social media, save to your computer, or print out to give out hard copies. Smilebox’s free Christmas flyer templates are quick and easy to personalize. You can easily change the colors, fonts, and music to reflect the look you’re going for. This Christmas, instead of sending a plain old email with holiday greetings, send a beautiful and thoughtful online Christmas flyer, designed for every festive occasion.